When I first saw a recipe for Bombay Sloppy Joes, I was intrigued because most homemade sloppy joe recipes I’ve tried are a little boring and honestly don’t really improve on plain ol’ Manwich canned mix. 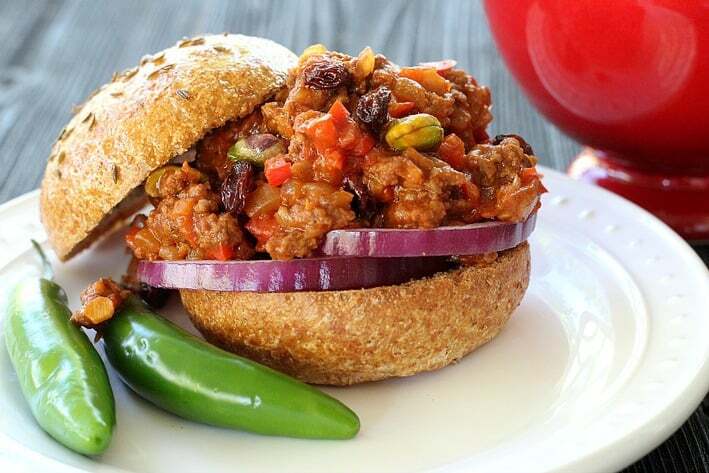 But these sloppy joes… THESE Indian, homemade sloppy joes are something really special that adults and kids will love. The original recipe calls for added honey and cream, but I found the end result to be too sweet, so I’ve experimented several times with the original until I decided on the version I’m sharing with you today. 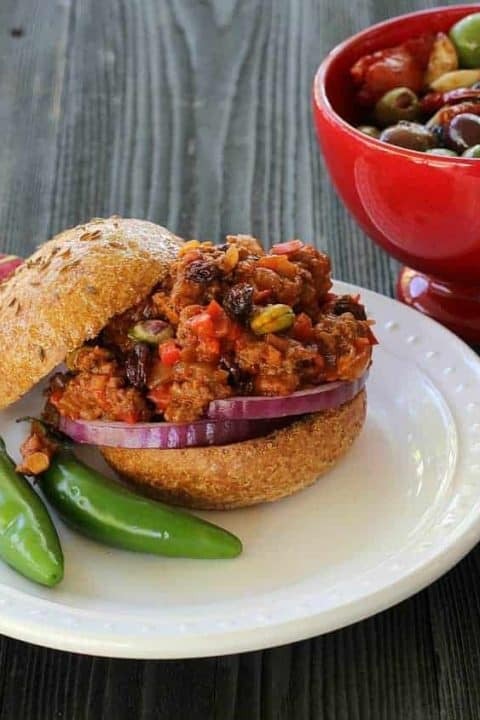 Enough like regular sloppy joes to recognize it is a “joe”, but this homemade sloppy joe recipe adds garam masala, paprika and whole cumin seeds in an incredible sauce featuring a trinity of garlic, fresh ginger and serrano peppers. 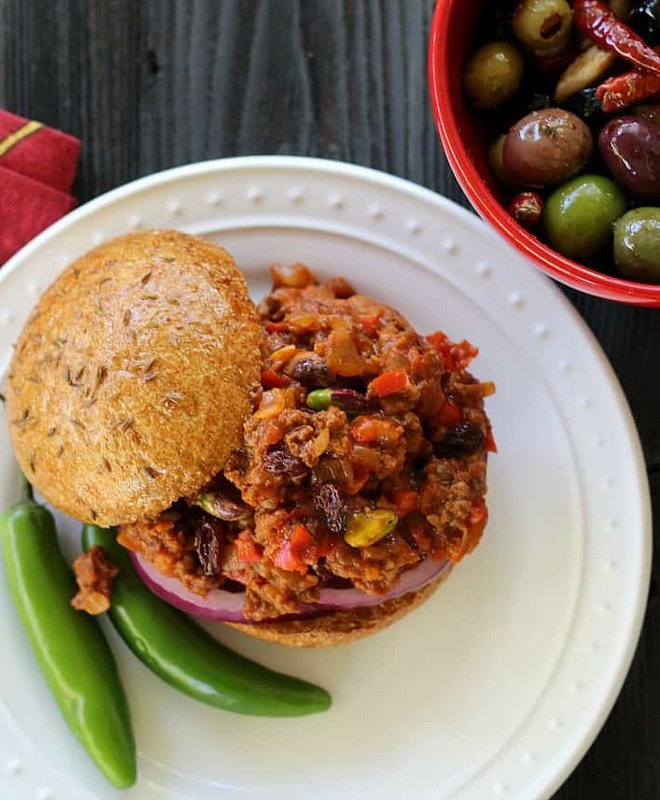 This is really something different, epecially since Bombay Sloppy Joes finish off with toasted pistachios and plumped up raisins tossed in before serving. The combination of fresh garlic, ginger and a half of a serrano chili pepper creates a warm base for the sauce, especially with the addition of the garam masala and paprika. And the plumped raisins and toasted pistachios add delicious texture and sweetness that take this recipe to the next level. This. Sauce! After the garlic, ginger, pepper, garam masala and paprika are heated and slightly browned in olive oil, add tomato sauce and water so you can simmer down and thicken everything together (only takes about 15 minutes). 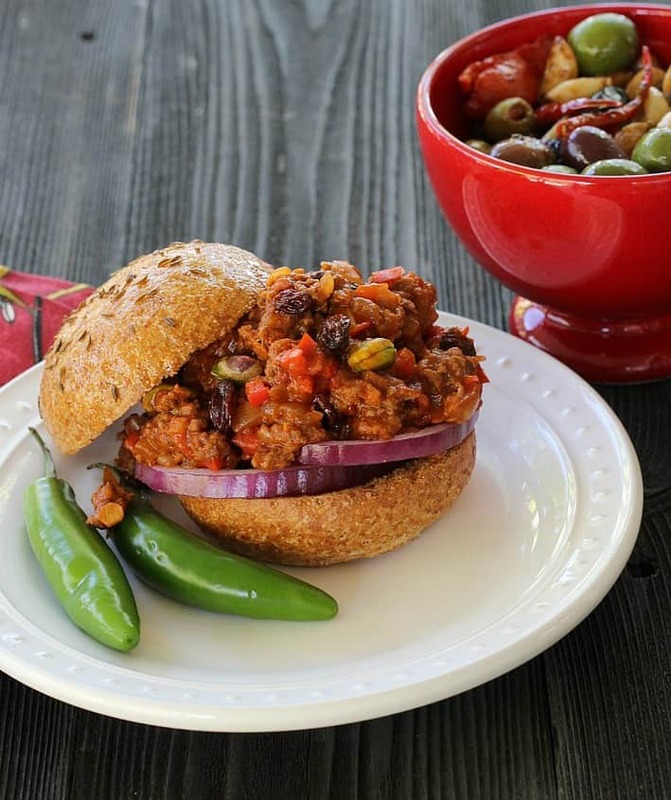 It wouldn’t be a sloppy joe recipe without red bell pepper and onions. But for a Bombay Sloppy Joe you need a little whole cumin to spice things up and another serrano chili pepper takes a bath in the mix just to release a little more flavor, not heat. If you want heat, then chop up the pepper at the end and add it back into the mixture. As an Indian-inspired dish the original uses ground turkey and I’ve had success with that, but I seem to make it with beef more often for my guys and they love it. Note: I’ve also made Bombay Sloppy Joes with soy crumbles for a vegan option and this was pretty darn good, as well. Just before serving, I toast whole wheat or rye buns, adding a little olive oil and extra whole cumin seeds to the top. Red onions add a fresh crunch and sweetness, not to mention pretty color. My husband prefers his without a bun so he gets it on top of a bed of lettuce and it’s fabulous. Bombay Sloppy Joes just might become your new go-to homemade sloppy joe recipe. If you’re hosting an informal party, serve these joes and you’re sure to be applauded for your originality and also be ready to share the recipe. You can make the sauce a day ahead and actually the full recipe is even more flavorful on the day after completion. Unique but still familiar, enjoy this recipe… and don’t skip the raisins and pistacios. You’ll be pleasantly surprised. Since this is an Indian-inspired dish, the original recipe calls for ground turkey (since beef is not eaten). If using turkey, be sure to get turkey thigh meat. Ground beef is excellent in the recipe and you can even use soy ground "meat" crumbles for a delicious vegan option. The sauce can be made a day ahead. 1 Serrano chile pepper don't chop it unless you want it really spicy! First thing, chop and mince all the vegetables so they're ready to go when you need them. 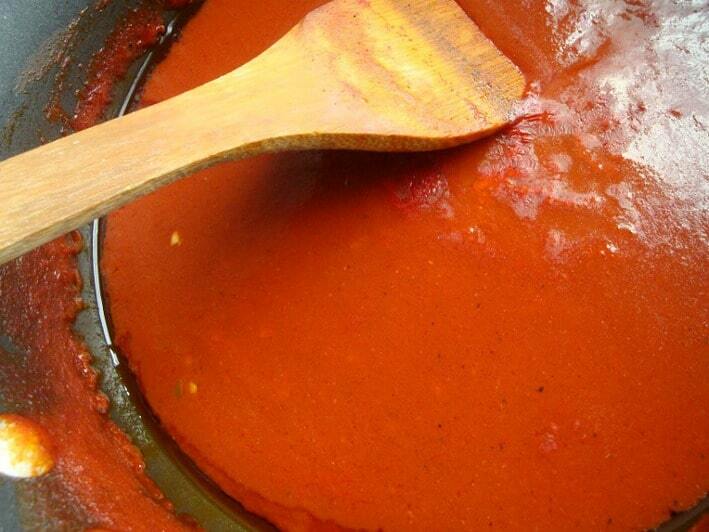 Make the sauce: Heat the olive oil in a medium saucepan over medium heat. Add the ginger, garlic and chile pepper and cook about 1 minute. stirring consistently while ginger and garlic lightly brown. Add the garam masala and paprika and cook 30 seconds. Add the tomato sauce and 1 cup water, stir and bring to a boil. Reduce the heat to low. Simmer, uncovered 15 minutes. Prepare the sloppy joes: Heat 2 tablespoons olive oil in a large skillet over medium heat. Add the raisins and pistachios and cook, stirring occasionally, until the raisins swell up and the pistachios toast slightly, about 1 minute. Remove from the skillet and set aside. Return the skillet to medium heat and add the remaining 2 tablespoons olive oil. Add the cumin seeds and let sizzle about 10 seconds, then add the onion and bell pepper and cook until softened and starting to brown, about 5 minutes. Add the chile pepper and cook 2 more minutes, adding the 1/2 teaspoon salt. Add the meat, breaking up the big lumps, and cook about 5 minutes, stirring occasionally. Add the prepared sauce to the meat and onion mixture in the skillet. Stir and bring to a boil, then reduce the heat to low. Cook until the sauce reduces and thickens, about 12-15 minutes. Remove the whole chile pepper. Stir in the raisins and pistachios. Taste for seasoning. Stir in the cilantro right before serving. Toast buns or rye bread and fill with the sloppy joe mixture. Recipe adapted from Aarti Sequeira for Food Network Magazine. The addition of raisins and pistachios seems weird but is incredible not to mention the different seasonings. We used grass fed beef and will try it with lentils next time for a vegetarian option. Great recipe! This sounds fantastic Sally. 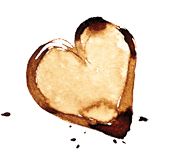 Love the flavors and idea of the toasted whole wheat bun with cumin seeds. Thanks Kevin, anytime I can add extra cumin is a bonus. This is a real family favorite. Thank you for including the url for the original recipe. I’m not one for dieting or using reduced or Low anything. I run 3 miles a day and exercise. I do this so I can stay healthy, while eating the foods I enjoy.I’m 70 yrs old and plan to live well into my 80’s or early 90’s. And I want to stay healthy, because I don’t want anyone to “have” to take care of mr. I am posting this comment because every site I go into looking for recipes, I find someone has posted a comment about some ingredient(s) they don’t like because they are unhealthy.The definition of healthy is constantly in flux, because some group or other finds that this isn’t good for you. I do my best to find out who paid for the research. That way I know if it’s a marketing ploy or not. 95% of the time it is. I will stick with what got me here, lot’s of exercise and indulging myself when I want to…….